But whatever you need, we can do it - whether its up to 20 mil vinyl thick or mesh to avoid wind load and weight for above the street. 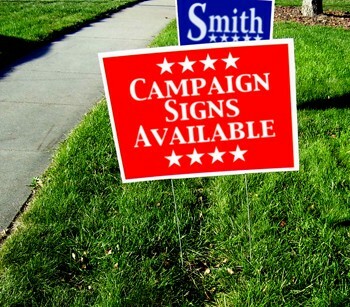 Need yard signs? We have you covered - all sizes and colors to promote your event. Printed on a 4 -10 mm coroplast material, these signs are strong, durable, weather resistant and available in B/W or full color. From 1 to 1,000. Ask us for a quote.